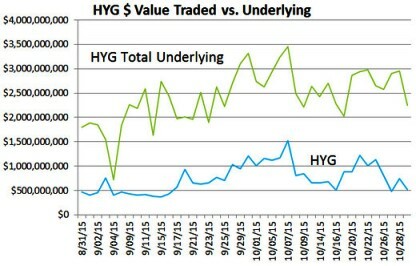 MarketsMuse Editor Note: For those unfamiliar with the logistics of buying and selling corporate bonds in the secondary market, and particularly for those not fluent in why/how corporate bond ETFs are priced and trade, the following column courtesy of IndexUniverse’s Dave Nadig provides a good primer. Important take-away: if an executing broker attributes a poor execution to “not enough liquidity”, we respectfully suggest that you are likely using the wrong broker. Apparently the last week around here has been iNAV week. With Matt calling for their banishment, me agreeing with him (much to my dismay) and Ugo Egbunike calling us both idiots. And Ugo’s points are all valid. INAV can be a fantastic tool, and one which smaller investors can use to make money. The action in this week’s bond market is a fantastic case in point. Now, bond pricing is a tricky thing. As Rick Ferri pointed out today in an excellent blog over at Forbes, when the liquidity of the bond market starts getting shaky, bond ETFs can trade well below their fair value. He uses that fact as reason to suggest avoiding bond ETFs. I see it as a trading opportunity. 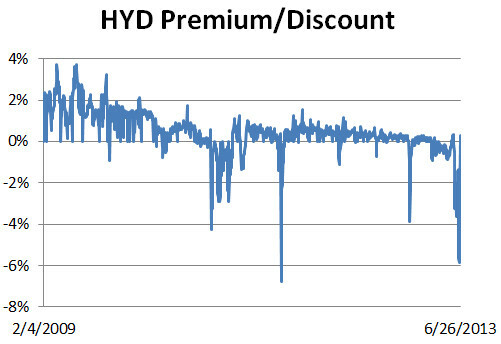 Let’s pick a simple example I’ve been following all week: the Market Vectors High Yield Municipal Bond ETF (NYSEArca: HYD). Corporate bond exchange-traded funds attracted investors in record numbers during the credit bull run of the past three years. They also attracted criticism for trading with more volatility than the bond markets they were designed to track. With the selloff in Treasury bonds rattling credit markets, those concerns are proving well founded. BlackRock’s iShares iBoxx $ Investment Grade Corporate Bond Fund has delivered a one-month total return of negative 2.98%, according to Morningstar. That compares to a total return of negative 2.06% for the widely followed Barclays Investment Grade Corporate Bond Index. An index of more liquid investment grade bonds run by iShares delivered a negative 2.67% return over the same period. The higher volatility of the ETFs in softer bond markets reflects the “inherent limitations of the ETF investment vehicle,” says James Lee, a senior analyst covering high yield at Calvert Investment Management Inc.
Because ETFs cannot hold large cash positions to cushion market swings, they become forced sellers of bonds when investors sell out and forced buyers when investors buy new shares. That dynamic lends itself to heightened ETF volatility in bond markets where securities trade less often, and with wider bid-ask spreads, than exchange-traded stocks and commodities. BlackRock Inc.’s exchange-traded fund arm, iShares, plans to launch a series of corporate bond ETFs that look and act like individual bonds. The proposed series of iShares Corporate Bond Funds will be a set of target-date ETFs, each holding a basket of investment-grade bonds set to expire in their given year. The San Francisco-based ETF provider already offers a similar suite of products that hold municipal bonds. Fixed-income ETFs have been in high demand for the past two years as investors look for more targeted and liquid access to bond markets. Bond ETFs had $39 billion of inflows through the end of September, the most of any asset class, according to Morningstar Inc. That puts them on pace to beat last year’s record inflows of $43 billion, which were more than double those in 2010. Even with the sudden popularity, bond ETFs have a long way to go to catch up with their equity siblings, which hold more than $900 billion. Mark Wiedman, global head of iShares, said he thinks target-date bond ETFs are one of the ways bond ETFs are going to catch up to equities, as they’re more like what the typical bond investor is familiar with. Mr. Wiedman explained that some traditional fixed-income investors aren’t fully on board with bond ETFs because they don’t know enough about them yet. Others are put off by the fact that the funds come with a ticker symbol and trade intraday, making them resemble a stock rather than a bond. They’re calling it the “ETF bid” — the idea that corporate bond prices get juiced when passively managed funds have to buy them. It’s known to happen in thinly traded stocks in some instances. So it shouldn’t come as a surprise that thinly traded, idiosyncratic markets like high-yield bonds are seeing a similar effect. It’s the cautionary part of an otherwise pretty encouraging story: ETFs’ power to crack open hard-to-reach asset classes for more investors. This week’s print Barron’s ETF Focus on the subject concludes that investors should be especially wary of selling passively managed bond funds when markets turn bearish — that’s often the best time to buy. And investors who buy these ETFs when markets feel rosy pay a premium for the service. Obviously, it’s best to avoid paying extra if possible. Yes, it’s the same old advice, to be a contrarian investor. But ETFs are only growing in importance in the bond markets. The more heavily they are traded, the more investors have to pay attention to their pricing dynamics — and that’s true even for those who don’t use ETFs. If you haven’t read our Barron’s print column, one of the key findings comes from Goldman Sachs’ (GS) Charles P. Himmelberg and Lotfi Karoui. The duo estimate that a monthly rebalanced portfolio of bonds tracked by the iBoxx $ Liquid Investment Grade Index, the benchmark driving the $24.5 billion iBoxx $ Investment Grade Corporate Bond Fund (LQD), has beaten comparable non-indexed bonds by roughly 4.7%, or about 1% a year, since the beginning of 2009. Great, right? Well, not always. Index bonds also appear to sink harder during bad times, as they did late last year. WisdomTree, the publicly traded New York-based ETF sponsor, today rolled out the market’s first broad-based emerging market corporate bond ETF, beating iShares and State Street Global Advisors to the punch. The WisdomTree Emerging Markets Corporate Bond Fund (NasdaqGM: EMCB) is an actively managed portfolio consisting of dollar-denominated investment-grade corporate bonds from issuers in Asia, Latin America, Eastern Europe, Africa and the Middle East. the fund, which is listed on the Nasdaq exchange, has an annual expense ratio of 0.60 percent. EMCB is an active fund that grants Legg Mason’s subsidiary Western Asset Management broad discretion in choosing credits. That process is crucial to keeping investors out of highly volatile countries and away from illiquid securities, Matthew Duda, EMCB’s portfolio manager, told IndexUniverse in a telephone interview.